If all this is true, it is very important. Is it? Well I’m a data guy and I happen to have the latest data on Indian Bt cotton (courtesy of the Indian Cotton Advisory Board). First let me say that I have already discussed the controversy over Bt cotton causing farmer suicides: the data just don’t support it. But if we take a similarly objective look at the data on Bt cotton’s “remarkable success,” there are some equal surprises in store, and a few inescapable ugly facts. India approved Bt cotton in 2002; now it accounts for 92% of all Indian cotton. Average nationwide cotton yields went from 302 kg/ha in the 2002/3 season to a projected 481 kg/ha in 2011/12 — up 59.3% overall. This chart shows the trends in yields, which took off after Bt was introduced in 2002 (as we are constantly reminded by GMO enthusiasts). The problem is that while yields did take off right after Bt cotton was approved, this was well before hardly anyone was actually planting Bt cotton! Look at this graph showing the yearly percentages of all Indian cotton land planted to Bt cotton. Now here’s ugly fact #1: Most of the yield increase happened between 2002-5 when Bt comprised between 0.4-5.6% of India’s cotton. Obviously Bt couldn’t have accounted for more than a tiny speck of the national rise. The graphs also show that — and here comes ugly fact #2 — in the last 4 years, as Bt has risen from 67% to 92% of India’s cotton, yields have dropped steadily. But it’s hard to generalize about a country that is as large and diverse as India, and those countrywide averages are hiding very different local patterns. This chart shows the yield trends in the 8 states with significant cotton crops; the trends are all over the map. Pretty messy. So let’s zero in on the 4 biggest cotton producers (the legend in this chart gives their ranking based on cotton acres in 2011). Let’s start with Andhra Pradesh, where I have been doing research for the last 12 years. Yields did go up when Bt came along, but the upward trend clearly started after the 1997/8 season; farmers didn’t adopt Bt in significant numbers until 2005/6 which is 8 years after the yields started climbing. (More on the A.P. story is available here.) Then the ugly fact #3: since 2007, yields in AP have dropped back to below where they were before farmers started adopting Bt cotton. Now for Maharashtra, kind of like AP but not as pronounced: yields started rising well before Bt became popular, and now have dropped back to around where they were before. Next is Madhya Pradesh, where yields have been going down ever since the 1997/8 season. Bt cotton doesn’t seem to have done anything to improve the steady slump. Finally we get to Gujarat, which is where the real action is. This state accounts for most of the national ri se in yields after 2002/3. Nobody knows for certain how much Bt cotton was being planted in 2001-3 because there were illegal Bt seeds on many farms (it’s an interesting story). Bt, illegal or not, surely played a role in the rise in Gujarat yields. So doesn’t that surge between 2000-2005 qualify as a “remarkable success” for Bt? It is important to consider that maximum productivity gains were obtained from the 0.6 million to 0.7 million hectares of new area under cotton in Gujarat, which had the benefits of more than 100,000 newly constructed check dams apart from the highly fertile soils that were under groundnut cultivation for several years before cotton was taken up. New technologies such as pesticides with novel modes of action…were introduced during 2001 and 2002. Therefore, it is probable that the new pesticides, new hybrids, new micro-irrigation systems, new areas, and Bt-cotton together may have been effectively contributing to the enhanced rate of production and productivity. The role of Bt cotton in effectively protecting the crop from bollworms… cannot be underestimated, but need not be overhyped either. I have read that the army of activists writing on GMO’s in India try to avoid the facts of the case. I think on some issues –like the suicide narrative — that’s a fair charge. But the counter-narrative of Bt cotton’s “remarkable success” also needs to he held up to the facts, and when you do, it gets ugly very quickly. Bt did not “double yields” in 5 years. National yields did rise from 302 to 554 kg/ha (up 84%) in the first 5 years after Bt was released, but almost all of that rise occurred in 2003/4 (when only 1.2% of the cotton was Bt) and 2004/5 (when only 5.6% of the cotton was Bt). In short, Bt couldn’t have been responsible for the rise. A more likely explanation for a rise in national yields in the early 2000s were the short-term gains from insecticides for sap-sucking pests. Bt adoption didn’t top 10% until 2005/6; since then, adoption has climbed to 92%. In that same period from 2005 to the present, national yields rose from 478 to 481 kg/ha — up 1%. In none of the top 4 cotton-producing states do the trends fit the claim that Bt cotton has boosted yields. Even in Gujarat, where yield gains were most dramatic, the adoption of Bt was only one of several key changes in cotton production. Over the last 4 seasons, with Bt adoption topping 90%, yields have dropped 13.2%. In AP, where I have watched the Bt saga closely, yields are lower than they were before Bt became popular. Now that’s ugly. This entry was posted in Agriculture, Biotechnology, India. Bookmark the permalink. Wow. This is very surprising considering how much consensus there is on GM cotton being a success story in India. Anders, this shows the public relations power of the biotech industry. The environmental group Friends of the Earth has put out a series of annual reports “Who Benefits from GM Crops?” beginning in 2007 that debunk many of the same myths that Dr. Stone does so elegantly in this piece on Bt cotton. These reports take special aim at the industry front group, ISAAA, which is endlessly inventive in its lies about GM crops. Very interesting and revealing, Glenn. I had come across the ISAAA report you link to earlier, and in Fig 1. it is shown that adoption in 2006 is above 40%. A bit suspiciously, the data is said to be compiled by the ISAAA itself. Overall, that graph seems to match yours when staggered by an year or two from the one you show alongside Fact #1. Fig 5 in their report then cites Cotton Advisory Board as source. Is this data publicly available? If not, how can one obtain it? It would be great to have. The Cotton Corp of India website provides the data. Also here is a great source. Well, all said and done, one must accept that no other farming technology was received by the Indian farmers faster than that of the Bt cotton technology in the history of Indian farming. Whatever may be the people against the Bt cotton technology say and try to prove the ill effects of Bt cotton technology, the fact of the matter is that the farmer is willing to buy cotton seeds ONLY if it comes with Bt technology. It was Bollgard-I initially, and now it is Bollgard-II technology that the farmer wants to buy the cotton seeds with. Can we be candid enough to understand the reasons for farmers grabbing this Bt cotton technology with both the hands and making it mandatory for any seed company to supply only Bt cotton seeds (and NOT non-Bt cotton seeds) if they have to be in cotton seed business? Are there any profound reasons for the farmers to be more than willing to pay a much higher price for the Bt cotton seeds than what they used to pay for the the non-Bt cotton seeds? Yes there are. Else, they would not be spending their hard-earned money in buying the Bt cotton seeds season after season and year after year. Farmers may be fooled once, but not season after season. A technology that was introduced in India mote than 10 years ago is still being accepted by the farmers. They want it. There is no point in showing yield data and trying to prove a point either in favor or against Bt cotton. Yield, be it an increase or a decline, is determined by many factors. Those who try to use the yield data to prove the ill-effects of Bt cotton would do better if they try to understand the reasons why the farmers are still demanding this technology in a country like India. If they are able to understand the farmers’ needs and also find the reasons of their dependence on Bt cotton technology genuine, they would do better if they try to help the farmers by seeing that the farmers use this technology in a proper way so that the farmers could continue to enjoy the benefits of Bt cotton technology for longtime to come. Else, if they have an alternative that they could offer to the farmers in place of Bt cotton technology, they can very well help the farmers learn about it and prove its benefits. Indian farmers are smart enough to catch it, and they would not mind to adopt it at a speed faster than what they did to Bt cotton, if they find it to be a viable alternative to Bt cotton. Without it, no amount of talking would help, and one would only be wasting time by talking against Bt cotton. It is not what people talk that counts. IT IS WHAT THE FARMER WANTS THAT COUNTS. I strongly believe that the Indian farmer can not be fooled by anyone, for too long. He is smart enough to judge what is good to him, and he would run after any technology that he thinks is beneficial for him. And, for him, it is his SURVIVAL that matters, let alone prosperity and freedom from x, y, and z.
Bt seeds were adopted at about the same speed in the 2000’s as the hybrid/pesticide-intensive seeds in the 1990s. Those seeds, of course led to the agro-economic catastrophes that created the demand for Bt. It’s fascinating to watch people present narratives about farmer wisdom. Input producers routinely denigrate it, calling farmers ignorant and tradition-bound, when the farmers aren’t adopting their product. As soon as farmers adopt their product, input producers salute the wisdom of the farmer. A good review of facts made in a very practical way…!!! I guess it is too much to ask for error bars on these graphs? The state-wise break up shows that there is a rather large variability across samples, and if conclusions about increase are questionable, so are conclusions about the decrease in AP. Sorry, there are no measures of dispersion — the yields don’t come from sampling but from comparing the total cotton harvest to the estimates for total acres planted to cotton. Good article, but it does not mention the cost reduction in using BT cotton. Cost reduction directly related to very expensive aerial spraying of insecticides. Aerial spraying that could account to a 50% increase of cost, which would obvously reduce farmer’s profits.The reduction of environmental hazards related to the use of these herbicides would also have been nice to graph. I have been working with cotton farmers in India for 12 years and never once seen aerial spraying. But there is a lot of published research on reductions in pesticide use (virtually all from backpack sprayers); my own multi-village study documented significant drops. But the counter-factual can also be that if BT was not adopted in 2005-06 onwards, yields could have declined dramatically if as you suggest the yields increased in the preceding 2-3 years largely due to ‘short-term’ means? Is that a fair argument? I’m not sure I’d call that a counter-factual, but it is certainly possible. It’s very difficult to say what would have happened if things had been different. I see that some GM proponents quote the Economic Survey of India cotton statistics, which show yields going up. Can you explain what each set of statistics refers to, please? Does the Cotton Corporation cover all the cotton grown in India? And how are the figures gathered for the economic survey? Thank you if you can help me see the wood for the trees. I wanted to ask if you have any guess or analysis of the reasons behind decline of the yield in recent years. Also, can I relate the rise in suicides in Maharashtra to the GM issue in any way? I find it very hard to explain the moves in cotton yield except in very general ways. I am sure that Bt technology played some role in yield rises (although the rises started before Bt became popular, and there were several other changes going on in cotton), but in some places it has led to surges in non-target pests. Actually in some areas the target pests (lepidopterans) are making a comeback — we are conducting a new survey in Warangal and quite a few farmers are reporting that lepidopterans are their biggest pest problem again. So declining effectiveness of Nt may be part of the problem. I have never been willing to attribute suicides directly to Bt; it just doesn’t make sense in terms of the history. But I believe (and have argued in print) that Bt seeds do contribute to, and probably exacerbate, the underlying problem of “deskilling” that is one factor in farmer suicides. Excuse me, can you include the references? They should all be linked in the post. Click on the highlighted phrases. Which one is missing ? Pingback: Council For Responsible Genetics Blog | Do We Need GMOs? very interesting article, my question goes a little in the direction of a previous contributor, do you have any suggestion what led to the extremely high adoption of Bt seed ? Which are the formal and informal channels by which technology is promoted? There have been several factors that interact together. These farmers have been on a pesticide treadmill for many years — they frequently ask me if I know of a new pesticide — and the Bt seeds offered a new pesticide. (And it did show early effectiveness, like so many other pesticides have shown.) But most cotton seed choices are driven by emulation (a phenomenon also analysed by bevaioral ecologists and economists as “density-dependent conformist bios” or “information cascades” or “recursive bandwaggoning”), and this accounted for much of the dynamics of the spread. Dealers are also a key source of advice and they pushed Bt seeds because of the much greater profit margin. In my research area, non-Bt seeds were unavailable by 2008, so there is no possibility of disadopting. Pingback: Harvest of Hypocrisy: Farmers Being Blamed for GMO Crop Failures | Pilataanko Suomessakin tarkoituksellisesti Suomen ilmasto ja maaperä? Tutki nyt asiaa avoimin mielin. Glenn, how can you say you don’t believe the Bt cotton suicide connection when the the states where suicides have increased since 2002 are in the very states where most of the Bt cotton is grown? Is it just a coincidence? India’s biggest spike in farmer suicides occurred in Andhra Pradesh in 1998, over 4 years before Bt cotton was sold and over 7 years before it began to spread. Farmer suicides did not significantly increase between 2002-2009, when adoption of Bt cotton rose from 0% to over 90%. There is no plausible mechanism by which Bt cotton would lead to suicide. A box of Bt seed costs around $10 more than a box of non-Bt cost (this varied, but $10 is typical), but farmers almost always save on pesticide expenses. So it sure isn’t debt. There is no evidence anywhere of Bt cotton failing more than conventional cotton. In short, no plausible cause for it to promote suicide. Glenn, this is with reference to your comment on April 13 suggesting ‘farmer emulation & dealer push due to higher profit margin’ as major factors for higher levels of Bt cotton technology by Indian farmers. While you may be right in your assessment regarding farmer emulation, I would like to disagree with you on the other. In general the technologies that are most widely adopted by the farmers in India are the ones that deliver a marked benefit to them and not to their dealers who sell them the products. Never a single product that has been pushed by the dealers for higher margins they get has seen the levels of adoption that Bt cotton has seen. Yes, dealers do push the products for which they get higher margins. They can sell them only in limited areas and for a limited period, generally for not more than one season. They can not fool the farmers for long. As such the dealer margins offered in case of Bt cotton are not very high. As far as I understand the companies that sell the largest volumes of Bt cotton seeds are the ones that offer the lowest dealer margins? Do you have any data to prove this statement wrong. If yes, I would be very keen to look at it. Coming to emulation by the farmers, yes you are right. Farmers do observe what their neighbors are growing and what the progressive farmers of their village are doing, and if they find it to be useful, economical, and profitable, they would emulate it. And, it certainly happened in Bt cotton and that has really helped Bt cotton acreages grow so fast and so soon. It is surprising to note that you mentioned that farmers In your research area have no possibility of disadopting Bt cotton, as non-Bt seeds were unavailable since 2008. Do the farmers in your research area asked for Bt cotton seeds? Are they willing to sow non-Bt if the seeds are available? Would you pls check with them what they are doing with the 120 grams of non-Bt cotton seeds they are getting with every Bt cotton seed packet of 450 grams? Are they sowing them or throwing them? They would do a world of good to themselves and to the cotton crop they grow, if they take advantage of these non-Bt seeds and sow them as refuse crop around the Bt cotton crop they sow. Cotton farmers in India want only Bt cotton seeds, and not non-Bt cotton seeds. Hence, many seed companies that have not acquired license for Bt cotton technology are out of cotton seed business. They would be happy to know about the areas and the farmers demanding non-Bt cotton seeds so that they could supply as much quantity as needed by them? Even the Government departments and research institutes are promoting only Bt cotton in India. Let us focus our efforts in finding the reasons why the farmers have chosen to adopt this technology in such an unprecedented manner and appreciate them for it. It is time for us to explore the ways and means of helping the farmers to learn and appreciate the need for proper stewardship and responsible use so that enjoy the benefits of the Bt technology for longer time to come. Interesting to have an anonymous reader with no empirical or theoretical support inform me how Indian farmers make their decisions, and then say we need to find out why farmers have adopted Bt seeds, when I have been field research on these questions and publishing results in top journals for 10 years. I will include a partial list of major studies on these questions which would get you started learning about the topic, although I don’t believe you are actually interested. Regarding your question on use of refuge seeds, the two most common uses are a) fill in spots where the Bt seeds failed to germinate, and b) discard. I don’t have data on the relative frequency of these uses, because it would be very difficult to confirm the veracity of answers, but both uses are common. A very small number of farmers plant refuge strips. G.D.Stone, et al. 2014 Rhythms of the Herd: Long Term Dynamics in Seed Choice by Indian Farmers. Technology in Society 36:26-38. G.D. Stone 2013 Response to Herring and Rao. Economic and Political Weekly 48(33):70-72..
G.D. Stone 2012 Constructing Facts: Bt Cotton Narratives in India. Economic and Political Weekly 47(38):62-70. G.D.Stone 2011 Contradictions in the Last Mile: Suicide, Culture, and E-Agriculture in Rural India. Science, Technology and Human Values 36:759-790. G.D.Stone and D. Glover 2011 Genetically Modified Crops and the ‘Food Crisis’: Discourse and Material Impacts. Development in Practice 21:509-516. G.D.Stone 2011 Field vs. Farm in Warangal: Bt Cotton, Higher Yields, and Larger Questions. World Development 39(3):387-398. G.D.Stone 2007 The Birth and Death of Traditional Knowledge: Paradoxical Effects of Biotechnology in India. In Biodiversity and the Law: Intellectual Property, Biotechnology and Traditional Knowledge, edited by Charles McManis, pp. 207-238. Earthscan. 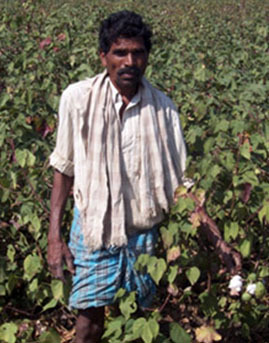 G.D.Stone 2007 Agricultural Deskilling and the Spread of Genetically Modified Cotton in Warangal. Current Anthropology 48:67-103. G.D.Stone 2004 Social Constraints on Biotechnology in Developing Countries. AgBioForum 7(1&2): 75-78. G.D.Stone 2004 Biotechnology and the Political Ecology of Information in India. Human Organization 63:127-140. Thank you Glenn for your kind and immediate response to my comments posted here. You may also like to read my comments posted earlier on this article on July 8, 2012. I am from an Indian farmer’s family working with the Indian farmers for the benefit of Indian farmers. I would like to appreciate your efforts done in the interest of Indian farmers. As far as I know Bt cotton here in India is a farmers’ choice for all the benefits it is offering. You and I or for that matter anyone can not force the farmer’s decision to buy any technology for too long. If it is good, it is accepted by the farmers. The acreages and the speed at which Bt technology spread in India season by season speak for themselves. No amount of negative talk could deprive the farmers the benefits of this amazing technology. A lot of people tried earlier stopping it coming by misleading the farmers. But once the farmers saw the technology, gained the benefits of it, and adopted it immensely, they could not stop it. A bad technology may be pushed by the dealers for their own gains, or a good technology may be stopped by some other people for their own gains. BUT, ANYTHING THAT IS BAD CAN BE DONE ONLY FOR A SEASON OR TWO, AND NOT FOR TOO LONG. ANYTHING THAT IS GOOD IS UNSTOPPABLE. AND, Bt-COTTON IS UNSTOPPABLE. It has expanded its coverage and its services to farmers in India season after season and year after year in the last 12 years. It has come here to stay. It will go on for quite some time to come, because of the services it is rendering to the farmers and the nation, and that the farmers want it. Regarding my question on use of refuge seeds, you mentioned that the two most common uses are a) fill in spots where the Bt seeds failed to germinate, and b) discard. Is this the purpose for which the non-Bt cotton are provided along with the Bt cotton seeds? No, not at all. Farmers are advised to plant the non-Bt seeds as refuge strips. You have also noted that only a very small number of farmers plant refuge strips. Why are the farmers discarding the non-Bt cotton seeds, and sowing Bt cotton seeds in that area too? As they see planting Bt cotton is more remunerative than that of non-Bt cotton, they don’t want to sow the non-Bt cotton even if the seeds are given free of cost. But it is important that the farmers sow the non-Bt strips also in order to avoid insect resistance development for Bt cotton and for continuing to reap the benefits of Bt technology for longer time to come. Yes, I have read a lot of articles and publications how Bt cotton helped Indian cotton economy and improved the livelihoods of cotton farmers in India. I would also like to read the articles published by you. Thank you for the list. I shall locate them. It would be great if you could kindly mail them to me (sivaprasad.bandarupalli@gmail.com) or provide me the internet links to access them online. Thanking you for the opportunity given to me to express my views on this topic, I look forward to learning from you and others on how best the benefits of this Bt technology could be extended to the farmers in a more sustainable manner. I have been reading a lot of information about cotton production in India lately trying to sort out the claims of Vandana Shiva and have come across this article… very good info..The introduction of imidacloprid makes a lot of sense as a primary boost to production in the 2000’s. I want to speculate that the dip in cotton production over the past few years is more attributed to declining fertility in cotton land soils with a corresponding drop in soil organic matter which has hampered root development and overall yield. Logic dictates the higher yields are taking more hearth from the soil than is being regenerated and after a good run of very high annual yields as Indian farmers have not yet caught on to increasing organic matter levels between crops.. would there be any truth to my perspective that soil productivity is lagging? From what I have seen, I wouldn’t be very supportive of the soil exhaustion theory. These folks have been farming intensively for a long time; there was heavy reliance on manure in the past and now both manure and inorganic fertilizers (subsidized) are used. Some people are concerned that the widespread use of Bt cotton over the past decade has caused some new types of soil impoverishment because of exudates. This is out of my expertise. I have seen studies linking Bt cotton with changes in soil microflora and soil nitrogen, but I don’t have an informed opinion on how much impact this is having on yields.